Twelve-year-old Martin Fletcher narrowly escaped death on May 11, 1985 when 56 people died and at least 265 were injured in a devastating fire in Bradford City football club’s ramshackle grandstand, including his father, grandfather, brother and uncle. 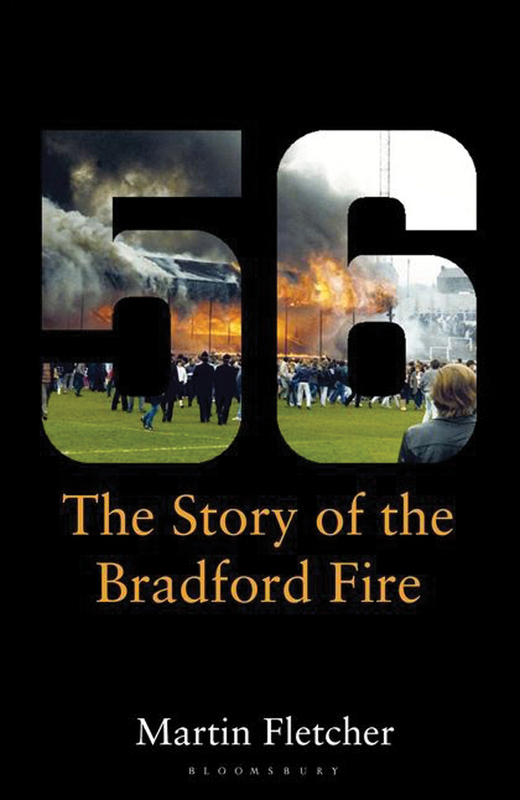 In his book “Fifty-Six – The Story of the Bradford Fire”, Fletcher questions whether it was an avoidable accident or arson for an insurance payout. The mood before the game versus Lincoln City at the Valley Parade ground was jubilant, with Bradford having just clinched the old Third Division championship and a record 11,000-plus spectators turning out to see the club presented with its first league silverware in 56 years. After 40 minutes of a drab first half, the score was 0-0 and fans weren’t so content. Five minutes before half-time, at 3.40pm, a glowing light was seen three rows from the back of block G in the rickety museum piece of a stand, built mainly of wood in 1908. Spread by the wind, the roof, which was covered with tarpaulin and sealed with asphalt and bitumen, caught fire. Burning timber and molten material began to fall onto the seating be-low and black smoke enveloped the passageway behind, where fans were trapped trying to escape. No fire extinguishers had been installed over fears of vandalism and less than four minutes after the fire was reported, it engulfed the whole stand. The blaze claimed young and old alike, with most fatalities occurring at the rear of the stand where people sought escape in a narrow corridor only to find turnstiles locked. Samuel Firth, a founder of the supporters club, was the oldest victim at 86; four 11-year-old boys were the youngest. Television cameras were there for the special occasion and one horrifying piece of footage showed a man in shock, walking across the pitch with his clothes alight as others scrambled to smother his flames. Most Bradfordians have accepted the fire was a terrible misfortune. Warnings had been issued over the stand’s antiquated wooden structure, which had been condemned and was due to be pulled down and replaced with steel and concrete. The Popplewell Inquiry concluded the fire was probably started by a match, cigarette or pipe tobacco slipping through gaps in the floorboards on to litter that had built up over the previous 20 years. Martin Fletcher lost his brother, Andrew, 11, father John, 34, uncle Peter, 32, and grandfa-ther Eddie, 63. Over the past 15 years he has devoted himself to seeking the truth about the disaster, and this book is the culmination of his extensive research. Fletcher reveals that there were nine other fires in the previous 18 years at businesses owned by or associated with the club’s then-chairman, Stafford Heginbotham, resulting in huge insurance claims and payouts of around £27 million in today’s terms. Fletcher does not make any direct allegations but he does believe Heginbotham’s history with fires warrants further investigation. The disaster at Valley Parade came at a time, according to Fletcher’s evidence, when the businessman was in desperate financial trouble, unable to pay his workforce beyond that month. Heginbotham had learned two days before the fire it would cost £2 million to bring the ground up to safety standards required by Bradford’s promotion. Yet this has never been reported and did not feature in the Popplewell Inquiry, chaired by then-high court judge Oliver Popplewell, which held its rushed investigation only three weeks after the fire and heard only five days of testimony. Fletcher quotes a report by the Fire Research Station, a government-funded body, that “features of the Bradford fire required a detail of understanding greater than that presented to the formal inquiry”. He spent months painstakingly researching Heginbotham’s business history by trawling 20 years of local newspaper reports into fires in the Bradford area. Fletcher reveals a culture of institutional neglect by governments and authorities generally indifferent towards football fans’ safety. Bradford City had received three separate warnings about the potential fire risk, two from the Health and Safety Executive and another from the council, but did nothing. Fletcher’s book tells how Heginbotham initially denied seeing the council’s letter before repeatedly changing his story when it became clear this was not true. The author says it was a “litany of lies”. Heginbotham died in 1995, aged 61, and was never prosecuted for the Valley Parade fire, despite the coroner later saying he had given serious consideration to bringing a charge of manslaughter. The jury at the inquest in 1985 delivered a verdict of misadventure. Fletcher is the only survivor to publicly challenge the official inquiry.”Could any man really be as unlucky as Heginbotham had been?” he asks. His compelling well-researched book invites the reader to decide.